Jaquet Droz introduces new versions of two classic models that are emboldened and embellished with the addition of a meteorite dial. I am particularly partial to the use of meteorite in watches because it’s literally the heart of a shooting star, and once I wrapped my head around that romantic little fact, my heart took over. When I gaze at a meteorite dial, I see a tamed piece of heaven displaying the eternal rotation of time passing. Meteorite is an iron-rich piece of rock from space that entered the earth’s atmosphere in a blaze of light and landed on earth. Meteorites are named for the locations in which they are found, and the variety used here in Jaquet Droz’s new Grande Séconde Quantième Meteorite and Grande Heure Minute Quantième Meteorite boutique editions is called Muonionalusta. The first fragments of the Muonionalusta meteorite were discovered on Swedish terra firma in 1906; this space rock is estimated to be about one million years old. This variety of meteorite is often used for watch dials because it exhibits prominent Widmanstätten structures, which are the typical striations caused by the stone’s crystallization in space that become obvious once the stone is subjected to a chemical bath. Despite this brand’s technical artistry, it is Jaquet Droz’s clean, perfectionist design that is more often than not the draw for its customers. And the addition of meteorite to two of its cleanest, most minimalist timepieces is nothing short of breathtaking. Simplicity, sophistication, elegance, refinement . . . these are just a few words that come to mind when I think of the Jaquet Droz Grande Séconde Quantième’s design. The ultra-clean dial is designed in the brand’s typical figure eight or infinity shape. The hours and minutes make their infinite rounds in the smaller, upper dial, while the seconds (which give this model its name, “Grande Séconde” meaning “large second”) and date (“Quantième”) share the space in the large subdial on the bottom. This model is powered by Jaquet Droz Caliber 2660Q2, which uses the historic Frédéric Piguet Caliber 1150 as its base. Frédéric Piguet is now the in-house movement manufacturer for Swatch Group sister brand Blancpain and produces movements exclusively for Blancpain and Jaquet Droz. The movement is exceptionally aesthetic and practically ultra-flat despite being automatic and boasting a long, 68-hour power reserve thanks to twin spring barrels. For more on the Jaquet Droz Grande Séconde Quantième, see Jaquet Droz Grande Séconde Quantième: Blending Purity And Design. For more information on the Grande Séconde Quantième Meteorite, please visit www.jaquet-droz.com/en/watches/grande-seconde/grande-seconde-quantieme-meteorite. How a “piece of rock” becomes a beautiful dial gracing the wrist of a connoisseur is part of a rare art form that involves having the trained eye scope out the part of the stone that would make for the most beautiful dial. Graining can look much different in various areas of the rock, and an experienced eye must choose just the right cut for a dial that highlights the beauty of the material. The meteorite is then ground and cut, after which it is cemented to a brass dial blank and ground again to make it perfectly flat and the exact thickness required. Cutting the holes and windows into the stone needed to accommodate the hands, applied markers, and even the date is also a perilous task as any slip of the hand would mean starting over. It goes without saying that each meteorite dial is unique in its own right. Jaquet Droz’s Grande Heure Minute Quantième from the Astrale collection is a model more for consumers who prefer the traditional hour, minute, and second hand setup on a watch dial. While this look is less typical of Jaquet Droz, it is no less beautiful. And the meteorite dial goes perfectly with this red gold case, too. The other big difference in this model is the use of Jaquet Droz’s Caliber 1150 P, which is also a derivative of the Frédéric Piguet Caliber 1150, but with an added silicon balance spring and pallet fork. For two more gorgeous meteorite-infused timepieces, see Antoine Preziuso’s Stella Polare Tourbillon Muonionalusta Fell From Heaven and Jaeger-LeCoultre Master Calendar Meteorite: It’s Out Of This World! For more information, please visit www.jaquet-droz.com/de/uhren/astrale/grande-heure-minute-quantieme-meteorite. A correction to make. Frederic Piguet no longer exists. After many years of being jointly owned and managed by Blancpain, it was merged into Blancpain. So now instead to two jointly owned companies, there is one, Manufacture Blancpain. This merger happened many years ago. Isn’t it time to stop talking about Frederic Piguet? 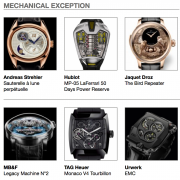 Further, Blancpain has done five major revisions to this moevement. It truly is now a new caliber…new free sprung balance, with inertial regulation and silicium spiral; new wheels made of copper beryllium, new barrel. What remains are the main plate and bridges. Thus truly is a Blancpain caliber and should be identified as such. Thank you very much for that additional information, Jeff. My goal in mentioning Piguet was to provide a little backdrop to understanding that this is a long-used and historic caliber base. This is positive information in my estimation.